How to Validate a Windows 10 System Backup Image? How to validate a windows 10 system backup image? The AOMEI Backuppe allows you to check whether your backup image files are validate for restoring successfully from the image file. Why you need to validate a Windows 10 system backup image? As a computer user, you may know that it is necessary to make a system backup of your computer, or backup other files. But you may meet the problem that when you try to restore from the system backup image, the Windows says it’s 0 bytes long, which may because of your system backup image is invalid. Actually, there are many situations can cause your backup image invalid, for example, if you stored data on the hard drive which is scratching, the backup image might be damaged. When your backup image file has been damaged, you cannot restore from it successfully. Well, is there a convenient way to validate that a system image backup is valid without actually do a restore? How to validate a Windows 10 system backup image? Make sure the integrity of your backup image file. The Check Image will check your backup image to make sure its integrity because part of them lost, you will fail to complete the restoration. Diagnosed the damaged data.Parts of the data may have been slightly damaged, although you can restore from the backup image, those damaged files or programs cannot be used normally. Check out the mistakes of the backup image file in time. 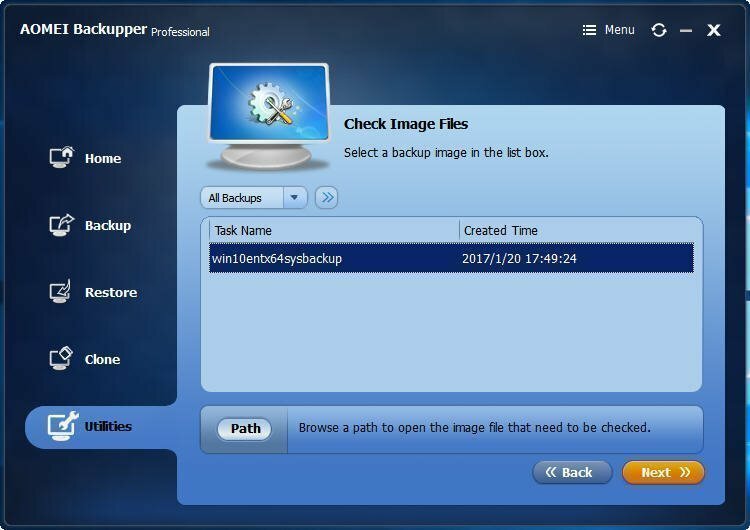 This feature will help you check if there is anything wrong with your backup images. For the security of your data, you’d better use the Check Image to validate backup image after you have backed up and before restore. 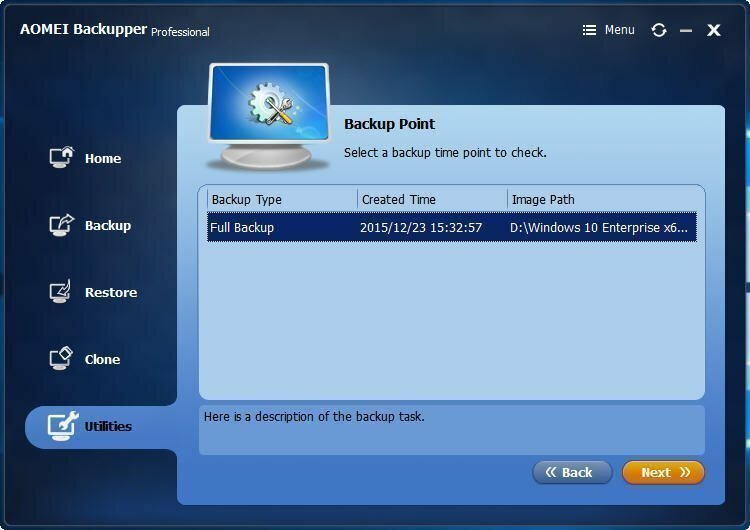 How to validate a Windows 10 system backup image with AOMEI Backupper? Step1. 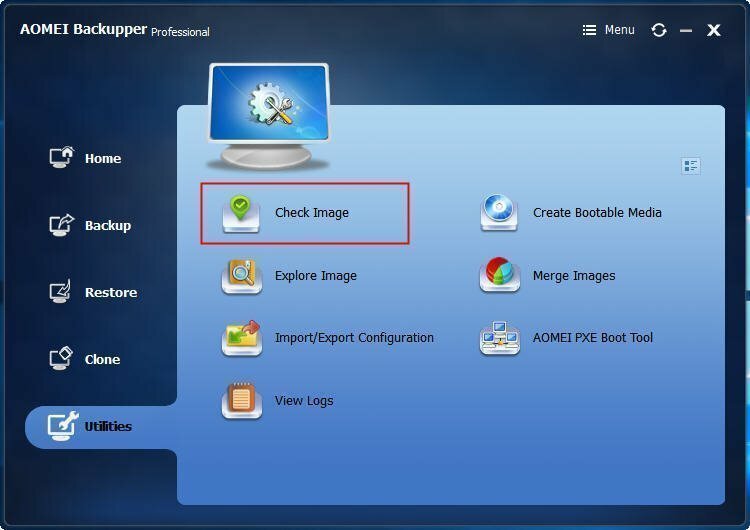 Install and launch AOMEI Backupper Professional on your Windows. Select Check Image under the Utilities tab. 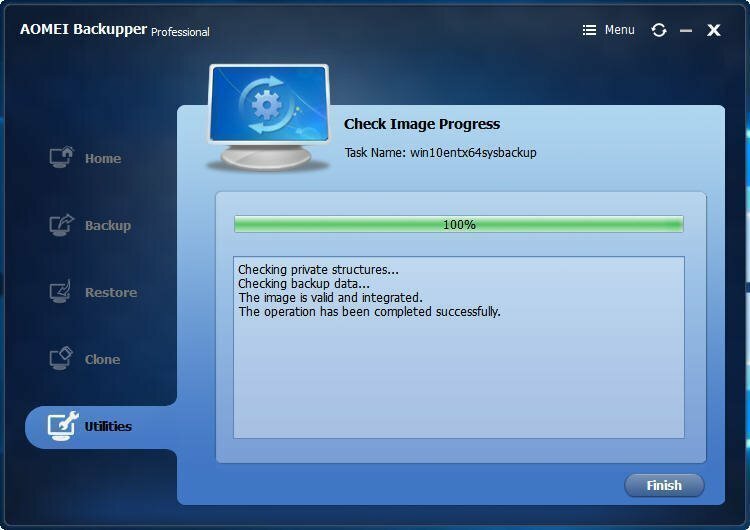 Step2.Select a backup image in the list box or click Path to open the image file that need to be checked. Step3. Select a backup time point to check here. Click Next, the task will be executed immediately. Step4. It will show you the progress in the following screenshot, if there is no problem, click Finish. This way is also suitable for other Windows OSes. AOMEI Backupper also provides you another edition so that you can use with Windows Server operating system. If you are Windows Server users, AOMEI Backupper Server can satisfied all your requirements.